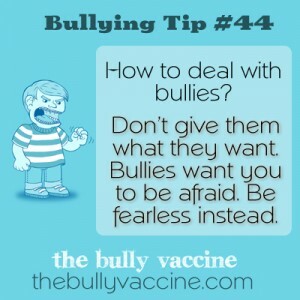 A kid asked me – how do I handle kids bullying me because I learn more than what is required. First off, learning more than is required is ALL sorts of awesome. 2nd, the science of behavioral extinction is super cool and applies here. Perfect for a geek who likes to learn. I answered the question over at Quora – link here for all the wonderfulness that is my answer. Some things you could say would be to just acknowledge – “Yes. Yes I am.” So – let’s pretend you were just called a bookworm. Answer – while smiling and looking them right in the eye – Yes. Yes I am. If they then say – “And you are proud of that? Your response? Yes. Yes I am. 3) Understand – THEY WILL ESCALATE – and that’s ok.
Just know – if they get worse, it means they don’t like what you are doing – so keep it up. Add in reporting as they get obnoxious to increase the cost of them behaving badly. Eventually – they will learn to leave you alone. It will be difficult for a while, but keep at it. 4) Finally – Keep Being Awesome! There is nothing wrong with learning more than what is required. It’s called curiosity and it’s a sign of intelligence. People who are intellectually curious – end up running the world. So keep being awesome.